Find a contract phone even if you have bad credit. Read our guide & compare deals. Are you struggling to get a contract phone because you have bad credit? Perhaps you have been turned down by a network provider due to your financial history or they wanted too big a deposit on the latest smartphone. At TigerMobiles.com we're seeing more and more customers approach us looking for a mobile phone with poor credit so we've sourced a range of bad credit mobile phone deals. Read through our guide and then compare deals below. TigerMobiles.com work with a range of trusted suppliers to help our customers find a contract phone even if they have bad credit. We will work hard to come up with a solution for you no matter what your circumstances. Before trying to take out a deal it's important to know why mobile phone companies don't award phone contracts to customers with bad credit. This is because the latest smartphones like the iPhone XR and Samsung Galaxy S9 are highly subsidised. Customers receive a free mobile phone in exchange for a 12 or 24-month contract. This lets new customers get a brand new phone at no immediate cost. The network or retailer then recover the money through a monthly bill. The problem arises when the company offering the free handset thinks that you’re a high-risk customer. Each of the networks has a pre-set credit score process. If you don't meet their requirements, they might not be willing to take that risk as they could lose money by bringing you on board. Make sure you are on the electoral roll. Sign up to the electoral roll and apply for a contract using the same address that you registered under. Consider choosing a cheaper mobile phone. – The more expensive the phone; the higher the chance of refusal. iPhones are the toughest phone to get for this reason so try and avoid the premium devices. Don't keep trying to reapply. If you have have been refused for a contract phone, don't keep reapplying as this does show on your credit rating and leaves a footprint. If you have been declined please see our advice below on the best course of action. Ensure you have a proper bank account. Many people with poor financial history don't have a bank account with a credit or debit card. This is essential for taking out a pay monthly phone. If you have been rejected for a mobile phone contract due to bad credit, then it's time to weigh up your options. Unfortunately, bad credit isn't the sort of problem that fixes itself. So if you want to get a phone contract soon, then you have to take action. Here at TigerMobiles.com, our recommended method is to take out a SIM Only plan. The approval rates on them are higher (industry reports suggest around 99%). SIM only will not only help you get a contract phone in the future, it will also help rebuild your credit rating across the board. Many customers turn their noses up at the thought of having to keep their old phone or buy a cheap handset outright for the short term. But the reality is unless you rebuild credit and prove to the network provider/retailer you are capable of making consistent monthly payments, you will never be able to get the latest smartphones on pay monthly deals. Using an older phone for 12 weeks isn't the end of the world, and it allows you to build a stable platform for the future. This will allow you to get the newest top-end smartphones as soon as they come out. Providing you pay on time, in many cases, the network will give you an opportunity to upgrade after 12 weeks on the plan. This option is the best course of action if you have been declined and is a much more sensible method than failing multiple applications. And for those wanting to avoid a credit check altogether, we have a range of no credit check SIM only deals available. What type of things negatively affect my credit score? If you have been declined for items like a mobile phone, loan or overdraft then no doubt know how frustrating it can be. The only feedback you receive is that you have been declined and get no accurate information on exactly why you were turned down. Each mobile phone provider has their particular criteria when it comes to credit scoring, but there are many common factors which are known to affect your credit score. If you know what these factors are, you improve the chance of getting accepted. 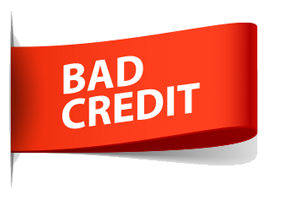 Bad credit history – things like CCJ's, IVA's, missed payments, etc. account for around 30% of your credit history. These can stay on your file for years, but they do diminish over time. If you start making regular payments on other goods like credit cards or insurance, then you are rebuilding your score. Lack of continuity – if you haven't been at your current address for a long time or have a history of being in and out of employment. Or keep changing jobs this can count against you. No credit card or bank account – if you don't have a proper bank account with access to a debit card or credit card you will not be accepted for a pay monthly phone. Is there such thing as a no credit check contract? Some retailers do offer pay monthly contracts without running a credit check, but this will only be for cheaper handsets. Smartphones like the iPhone XR Max and Galaxy S9 will always be credit checked. Because they are high-end devices the chances of getting declined due to bad credit or an IVA increase. TigerMobiles.com recommends that customers with a poor credit history choose a cheaper phone. This reduces the risk outlay for the network or retailer. Most networks now offer early upgrades, so once a customer has proved they can pay on time each month the option to get the latest Samsung Galaxy or Apple iPhone will be available. What about guaranteed phone contracts? Any mobile phone contract that requires a credit check cannot be guaranteed. Some firms do offer guaranteed phone contracts, but this will only be available on low-value handsets where the risk level is low. If you see any form of marketing offering guaranteed iPhone contracts this is likely to be false. Checking your credit score is a good idea. It lets you know where you stand and find out what sort of problems are preventing you from taking out a pay monthly phone contract. In some instances, missing details or an incorrect piece of information on your credit file could result in being declined for a phone contract and it's important these are corrected. TigerMobiles.com recommends you use Experian, Equifax or Clearscore to view your credit history. Why can't I get the latest iPhone XS with bad credit? Are there any iPhone deals with no credit check? When you browse the deals below you'll probably notice you can't find the latest iPhone XS Max or Samsung Galaxy Note 8 in and amongst the deals. The reason here is that if you do have bad credit, you won't be approved for those devices. All you'll walk away with is another lookup on your credit file showing a refusal of credit and nothing to show for it. The cheapest iPhone XS Max retails for £999, so it's rather a big ask for a retailer to send you this device for free when they can't be certain you'll pay them back for it in monthly repayments. Rightly or wrongly this is all decided by a computer, so even if you have the best intentions in the world and the money to afford monthly repayments, a poor credit history will stop you being approved. So take our advice above, choose a cheaper phone, put down a deposit, rebuild your credit and when the iPhone XI is released, you'll be in a far better position to be approved. Are there any networks I should avoid if I have bad credit? Most UK network providers operate a very similar credit scoring process for their handsets, that's because they all subscribe to the same datasets from providers like Experian and Equifax. So if you have failed one credit check, any other operator will be able to see that you've failed elsewhere. No one network is better than the other in this regard. But there are certain types of deals you should avoid applying for such as Unshackled, O2 refresh deals, Virgin Freestyle, Tesco Mobile Anytime Upgrade and giffgaff handsets. These plans are known as handset financing agreements and classify as a financial product which falls under tighter regulations. As a result, the credit check is harder to pass. So if you do apply for a contract we recommend going for a traditional 24-month style deal. Is it possible to get a phone contract with a free gift if you have bad credit? Trying to apply for a contract that comes with a gift like a games console or laptop when you have a poor credit rating is not a good idea. When you are likely to be declined for just a phone contract, adding in some form of gift sees the risk level to the network increases significantly and you will not be approved. So avoid these deals completely. Do you have any deals for bad credit customers with no upfront cost? All the deals in our comparison system below contain phones that have an upfront cost for the handset ranging from as little as £10 through to over £100 depending on the smartphone. Our industry experience has taught us that customers who put down some money up front are far more likely to be approved for a contract phone. If you can't afford to put down £30 when you checkout, then we don't think a contract phone is something you should be applying for. Instead, why not save up some money for a number of weeks, buy a SIM free phone outright so you own it from the word go and take out a sim only contract to go with it. Tiger Mobiles was awarded 4.64 out of 5 by Reviews.co.uk based on 67 reviews.